"Spinoza knew that all things long to persist in their being; the stone eternally wants to be a stone and the tiger a tiger. I shall remain in Borges, not in myself (if it is true that I am someone), but I recognize myself less in his books than in many others or in the laborious strumming of a guitar. Years ago I tried to free myself from him and went from the mythologies of the suburbs to the games with time and infinity, but those games belong to Borges now and I shall have to imagine other things. Thus my life is a flight and I lose everything and everything belongs to oblivion, or to him. --J.L. 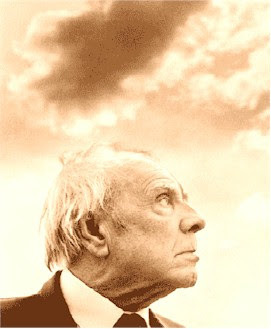 Borges, "Borges and I"
The above passage is an excerpt from one of my favorite philosophical essays, "Borges and I." I like it because it's short! But also because it accurately portrays the relationship between identity and forgetting. Borges describes how the true self operates not through memory, but through forgetting, through oblivion. The writing is always an attempt to make Borges anew, to break out of the cage of his older self, the other Borges, the one written. Somewhat paradoxically, it is through the loss of the self that the true self emerges. We become our true selves by breaking with the selves that we know, by forgetting them, and by stepping out into oblivion. This is the case because the self is dynamic, an actor, a process, not a thing or an identity. In order to express this dynamism, the self must be constantly breaking out of the concepts, habits, and memories that threaten to keep it static. This is a process that must be endlessly renewed, however. Thus, in a weird way the new self must always be repeating encounters with its old selves, the remembered selves. We don't leave them behind, not permanently. Rather, they are jumping off points, their edges marking the void of new possibility. Runners know this process well. Our training is a physiological activity, to be sure, meant to have an effect on our organs, our muscles, bones, and capillaries. But it is also a mental activity, a constant battle of memory and forgetting. Training is a way of working through the runners that we remember ourselves to be, and it is, as Borges shows us, both an attempt to shatter the memories of those runners and also an attempt to build memory anew. This is, really, my fourth life as a runner. The first runner that I was knew nothing of training, times, distances, or records. Running was not an identity, but a pure activity. It wasn't something I sought or identified with. It was just what I did: down the hall in a new pair of shoes; after a soccer ball in the rain; chasing my friends through the woods. This runner was not a runner at all: but he ran. The second runner ran in high school. This runner was concentrated on two things: competing and excellence. This runner had begun to conceptualize himself as a runner, mainly because he found in it a way to prove himself as a singular being. So, for this runner, running was about being exceptional, about being better--the best, even. It was about separating myself out from the rest of human beings and finding myself in this solitary act. The third runner ran in college. He was not so distinct from the second runner, but beginning to expand the circle of exceptionalism. This runner was concentrated on the culture of running. Here, the running became conceptualized in the first person plural--we were runners. I wanted to find others like me, a narrow band of skinny brothers who found joy in being fast, in eating tons, and in bonding together on a Saturday morning in a blurred ritual of pain and glory. That's what running was for me then--I still never kept a log or thought a shred about proper training. But I damn sure showed up for practice and found deep layers of strength in competing for a team. The fourth runner came after a break. This runner is reflective, and is always built in relation not only to running, but to those prior runners. For this runner, running is many things, but what it is most deeply is an ingrained habit. It's not a struggle to prove myself different, not an attempt to find a larger community, and it's not an unconscious activity. But because this runner finds himself in relation to these prior runners, this runner is essentially concerned with regaining something lost--or perhaps exercising something before it is lost. This runner sees time slipping away, sees the need to make himself new. Because of this essential relationship with time, for the fourth runner running takes the explicit form of memory. I run because I've always run, because it's what I remember about myself. And perhaps this is why I write my running down, recording my daily runs and training paces. Maybe this is why I'm more concerned with running PRs, with being faster than prior selves, better than I was before--or at least as good. It's an activity that is meant to preserve the best of what I've built over this life. And perhaps make what I've built a bit better. So, this final runner is essentially comparative. He wants to run as well than he did before. He wants to run with the same joy that he ran with before. He wants to remake his memories, to not let them be memories, to let those memories live again today. But of course, this is impossible. That's what Borges was writing about. The memories we cherish were made in moments that were whole to themselves. The only sincere homage that one can pay to memory, therefore, is oblivion. Those moments we remember weren't reflective; they were originary, first-born. This fourth runner finds those moments, too. They are there: cicada-evenings, riding tireless legs, or in those races in which one feels the full power of the self, that dynamic self. We still have a self that goes beyond memory, one that does not merely remember, but is also capable of making memories. Yes, that fourth self, the remembering, comparative, slightly obsessive and certainly analytical self can also find itself occasionally skimming along, running out of itself, absolutely oblivious and momentarily free. Yes, impossibly, we find ourselves transformed, once more, by the thing we have always done but never finish: running. this is a rich & well-organized post. i have a memory of enjoying the experience of consuming it. I took my time reading this. It deserves to be read reflectively. Hopefully I'll not remember my previous running selves and run anew each season ahead of me. Thanks, Daniel. Thanks for posting! It always makes me happy to know that folks are reading. Daniel, good stuff. I guess the important thing is neither remembering nor forgetting, but figuring out how to do them in the right way. The hard part is that we often don't have a choice with respect to memory! Sometimes, it seems like my memories choose me, rather than the other way around. Hey, just came across your blog. I am enjoying your posts. Thank you! Hi "trail jogger," thanks for the kind words! I hope you keep enjoying it. Thank you, Rose. Great name!